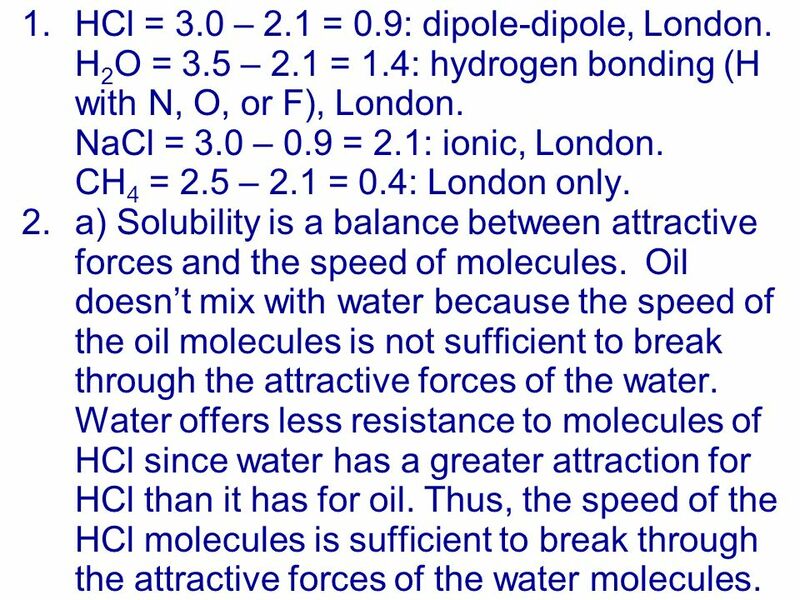 1 1.HCl = 3.0 – 2.1 = 0.9: dipole-dipole, London. H 2 O = 3.5 – 2.1 = 1.4: hydrogen bonding (H with N, O, or F), London. NaCl = 3.0 – 0.9 = 2.1: ionic, London. CH 4 = 2.5 – 2.1 = 0.4: London only. 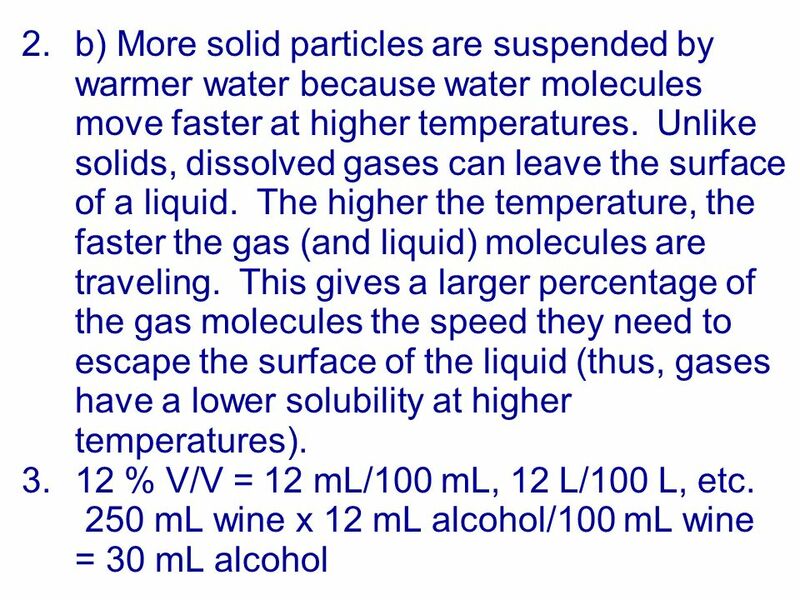 2.a) Solubility is a balance between attractive forces and the speed of molecules. Oil doesnt mix with water because the speed of the oil molecules is not sufficient to break through the attractive forces of the water. Water offers less resistance to molecules of HCl since water has a greater attraction for HCl than it has for oil. 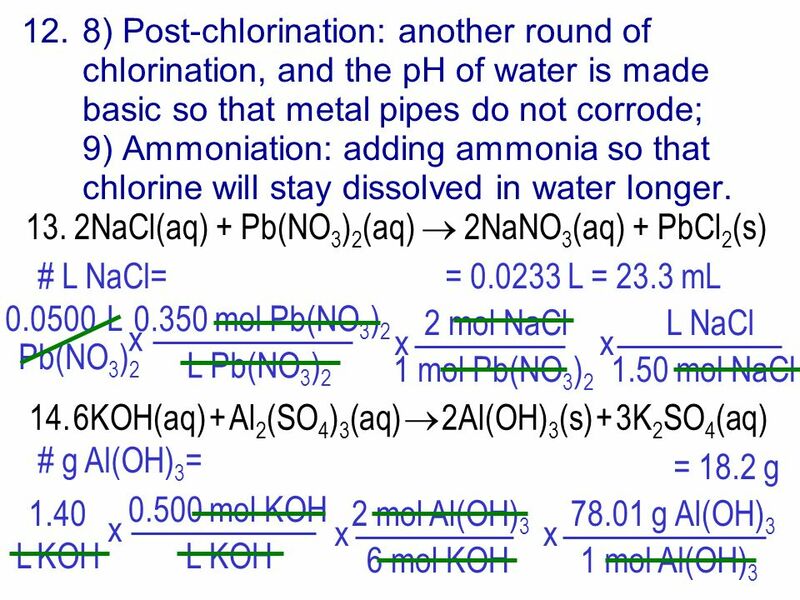 Thus, the speed of the HCl molecules is sufficient to break through the attractive forces of the water molecules. 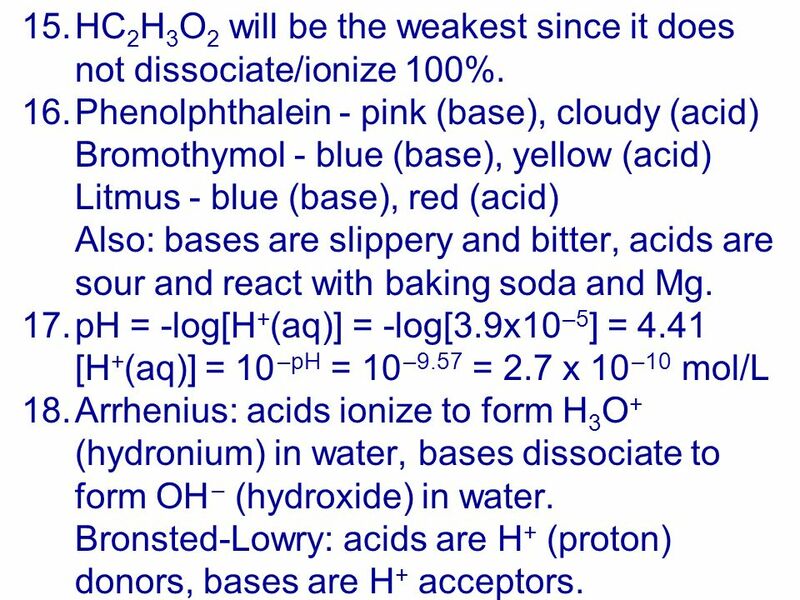 7 15.HC 2 H 3 O 2 will be the weakest since it does not dissociate/ionize 100%. 16.Phenolphthalein - pink (base), cloudy (acid) Bromothymol - blue (base), yellow (acid) Litmus - blue (base), red (acid) Also: bases are slippery and bitter, acids are sour and react with baking soda and Mg. 17.pH = -log[H + (aq)] = -log[3.9x10 –5 ] = 4.41 [H + (aq)] = 10 –pH = 10 –9.57 = 2.7 x 10 –10 mol/L 18.Arrhenius: acids ionize to form H 3 O + (hydronium) in water, bases dissociate to form OH – (hydroxide) in water. 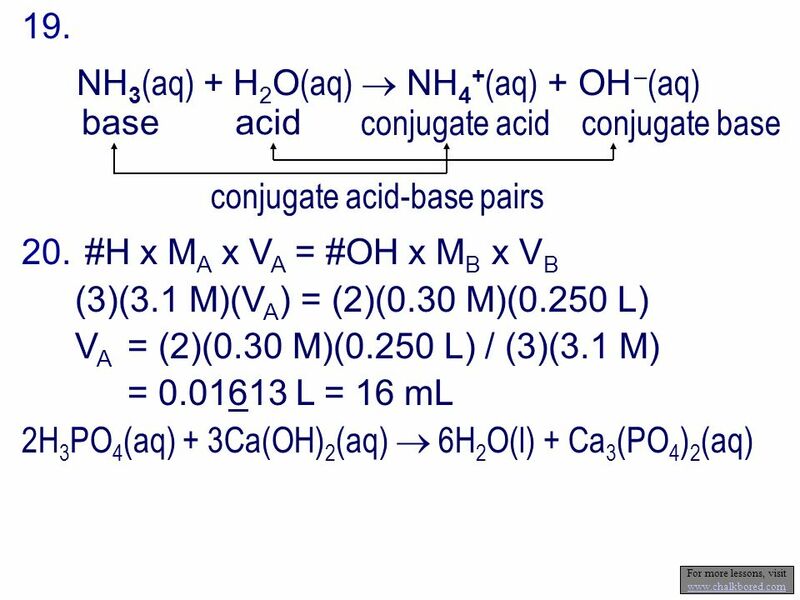 Bronsted-Lowry: acids are H + (proton) donors, bases are H + acceptors. 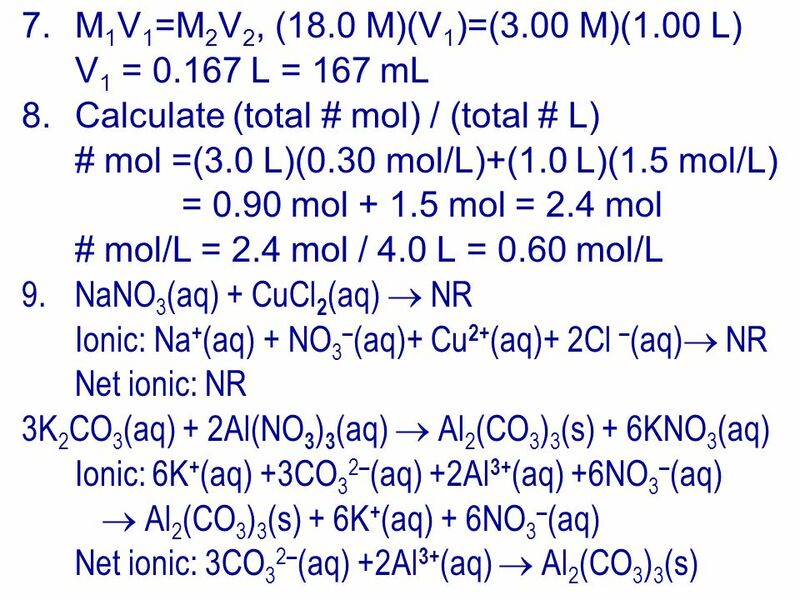 Download ppt "1.HCl = 3.0 – 2.1 = 0.9: dipole-dipole, London. H 2 O = 3.5 – 2.1 = 1.4: hydrogen bonding (H with N, O, or F), London. NaCl = 3.0 – 0.9 = 2.1: ionic, London." 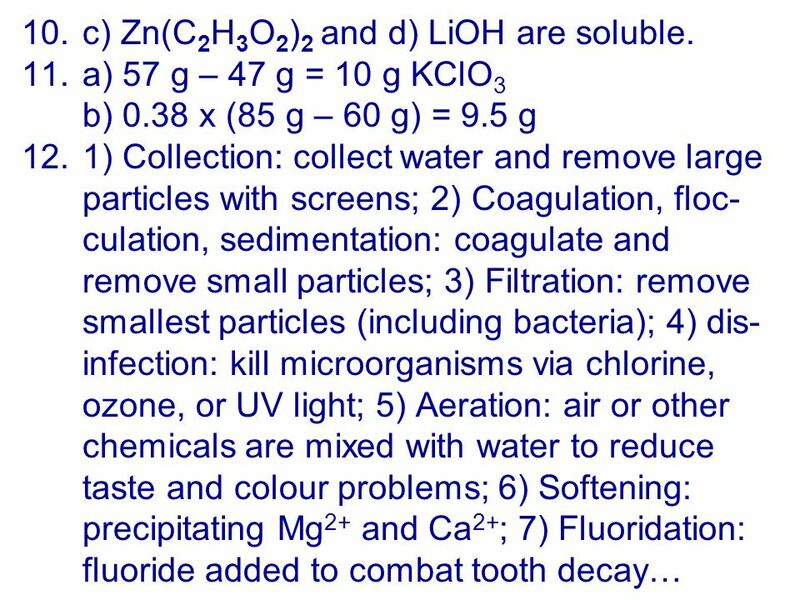 Properties of acids Taste Sour (kids, don’t try this at home). The Joy of Balancing Equations. 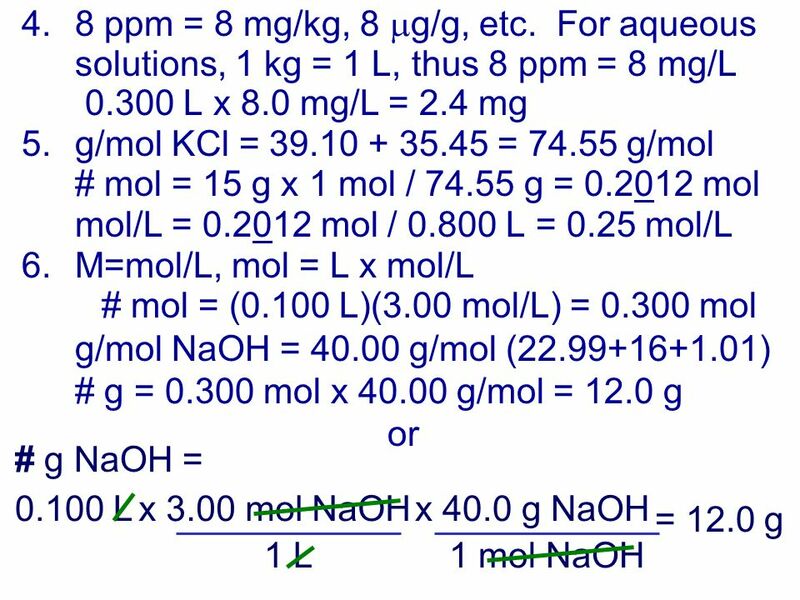 What we already know… Coefficient 2CaCl 2 The 2 tells you that there are 2Ca and 4Cl CaCl 2 Subscript The little two tells. Chapter 19 Acids and Bases. Properties of acids and bases Get 8 test tubes. Rinse all tubes well with water. Add acid to four tubes, base to the other four. Touch a drop of base.